As much as your wedding is about looking fantastic, it is also essential to feel comfortable in what you wear on the day. You will be spending hours on your feet, and a pair of ill-fitting shoes may ruin the entire experience. Although it may look great, you do not want to end up with blisters, sore ankles or pinched toes from wearing a pair of shoes that aren’t up to the task. Then again, you don’t want to compromise on the look either. So, what do you look for when choosing the shoes you are to wear on your big day? Let us find out. Let this be the main determining factor when you start looking for your wedding shoes. Good shoes should be constructed with extra padding and cushioned soles that make it comfortable to wear for hours at a stretch. Consider the height and structure of the heel. Make sure you choose a comfortable height (3 inches at the most). If you aren’t used to wearing high heels but still want the added inches. Choose platform heels or kitten heels to feel comfortable. Choose ones that are open toed or round, so they don’t pinch. Another factor to consider is the venue where your wedding will be held. For an outdoor wedding, choose wedges or flats, while flat heels are best for beach weddings. Break them in, by walking in them before your wedding day. This way, you’ll be more comfortable in them on your wedding day. Your shoes are on special duty on your wedding day, so set aside a higher budget than you would for regular shoe shopping. 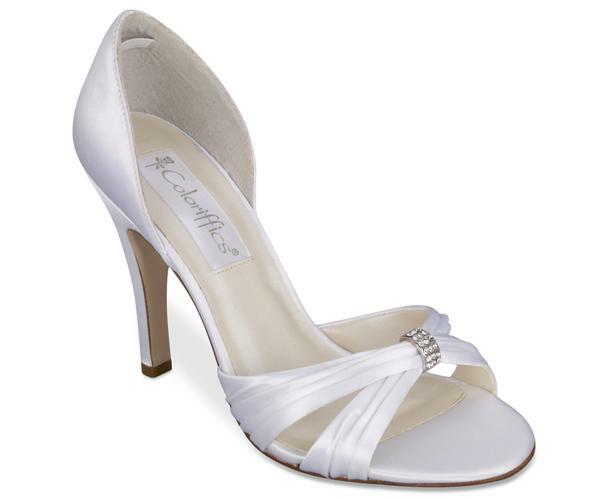 Put aside roughly 10-15% of your wedding dress cost for a suitable shoe. To compliment your wedding dress, you would have to find one that matches the white of your wedding dress. Shoes, like gowns, come in various shades of white. The best way to find a matching shoe is to carry fabric swatches of your dress to find the shoe color that goes with it. Make sure that you go shoe shopping in the afternoon, when your feet swell the most. At the store, try on shoes in both greater and smaller sizes, apart from the one you think is right, to determine the best fit. Walk around in it, and see if it feels snug or slippery. If you will be wearing a long wedding gown, or one with an embellished hem, make sure that your shoe doesn’t tug on the fabric and cause damage to it. It is a good idea to choose your shoes after you get your wedding dress, so you can choose one that will match perfectly and also be comfortable. Make sure you take your shoes to your wedding dress fittings, so that your dressmaker can adjust the hem of your bridal gown to the right length by adjusting for the heel height. Keep these points in mind and you are set to put the right foot forward, when you go shoe shopping! Visit us at Best for Bride to browse through our shoe collection and all your wedding needs, shopping advice and more! I cringe when I see high heels. I think you can go with a fashionable, lower shoe and it would make the same impact!